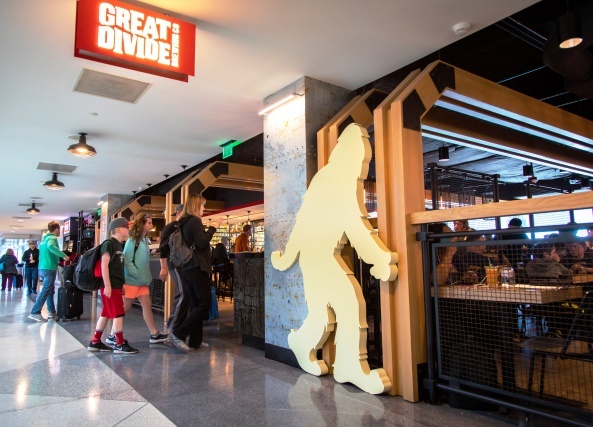 HMSHost and ACDBE partner Colleen Forst have partnered to bring the popular local brewery/restaurant Great Divide Brewhouse and Kitchen to Denver International (DEN). Located in Concourse C, Great Divide Brewhouse and Kitchen features a full line-up of craft beers, including a rotation of small-batch and seasonal brews, as well as signature cocktails. The food menu includes Yeti Braised Short Rib Tacos, Farmhouse Ale Chicken as well as a variety of small plates, soups, salads and desserts such as Bread Pudding with Cap’n Crunch and white chocolate. The restaurant also serves breakfast items such as the Breakfast Burrito and chicken and waffles, and has a designated grab-and-go section so travelers in a hurry can pick-up drinks and snacks for their flight. “Great Divide is an iconic Denver institution and now we’re thrilled to make it the perfect stop for travelers to enjoy its award-winning craft beer, along with perfectly matched culinary delights before or after their flight,” says HMSHost VP for Business Development Stephen Douglas.